Umami is a sort of buzz word in the culinary world. But what is it? Everyone has four different basic tastes; sweet, salty, sour and bitter. Umami is believed to be the fifth taste. It’s this deeply rich savoury taste. Umami is easily found in animal products such as meat, cheese, fish and foods that have been caramelised. For some who follow vegan diets it can be hard to find that umami taste, which could be why they still crave animal products. There are plenty of plant-based umami rich sources which can add a depth of flavour to your dish. Here are some easy sources of umami flavour and a recipe of my favourite dressing. 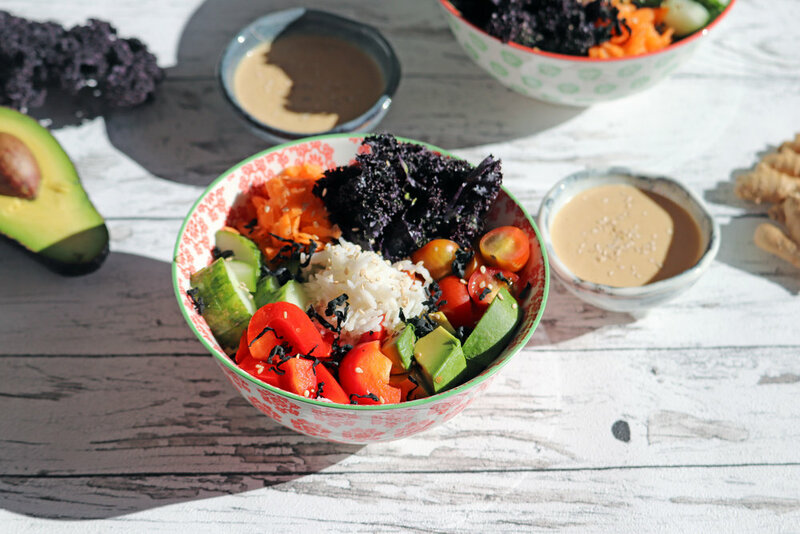 This is my all time favourite dressing, I use it on salads, roasted vegetables and with this sushi bowl recipe. The inspiration for it came from a trip to D.C. I was visiting a friend there and ordered a sushi bowl at a random cafe. It was so good that I thought about it for days and had to recreate it when I got home. It took a while but this ended up being the recipe I came up with. It’s deeply flavourful and really has that rich umami taste to it. If you’re a fan of ginger and soy sauce then you're gonna love this dressing. Boil the rice as that takes the longest time, I like having the rice cold in this dish, to each their own. Mix together the ingredients for the sauce in a blender or food processor. Slice the vegetables you want to use. Put everything in a bowl, using the rice as a base and pour the sauce over.